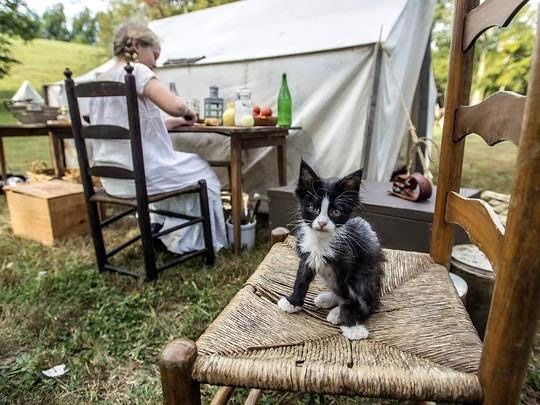 Traveling cat spotted during the Battle of Perryville Commemoration in Kentucky, USA. The Perryville Battlefield on October 8, 1862, was the site of the bloodiest Civil War Battle fought in Kentucky. Each year, thousands of guests visit Perryville to watch a re-enactment of that clash. There are history encampments, lecture series, antique and vendor tents, a commemoration parade, ghost tours, authentic meals over an open fire, flea markets, food festivals, and street performances. Sounds an interesting place to visit. Have a tremendous Thursday. Il est tout mignon ce chat. Et ses vibrisses sont impressionnantes. OMC Kitty needs sum gwoceries. Gweat foto. Yep, that one needs to eat but it is cute, cute, cute! Looks great, and sounds interesting! That is one fluffy, fluffy cat. I wonder what part it played in the re-enactment. Cute little re-enactor kitty! He looks so authentic -- that's good attention to historical detail LOL! Beautiful kitten - definitely needs a good feed! Super cute, but unfortunately it looks to be in need of both food and medical care. Hi! This cat is very cute. Thanks for sharing. He's so scrawny he's adorable! Aww such a sweet little kitty! Someone needs to feed him though! Hello there. Even when they're thin and scrawny (like this one), cats are still photogenic! (Lol) Love your catty blog (no pun intended). Your A-Z posts were pretty cute too. Well done for completing the challenge! Visiting from the Road Trip. That little kitty sure is cute, but it looks a little thin. Little kitty looks like he needs a little TLC and regular meals. What a sweet little baby. Definitely looks like he could use a little TLC.